What exactly is Hermitage? French Hermitage? Aussie Penfolds Hermitage? Some find this confusing. First of all, literally it means a hermit in seclusion, and the “H” of Hermitage is silent. Hermitage is the most famous of all Rhone Valley, French appellations/qualifications, although only a small area (311 acres to be exact). Red Hermitage wine is made solely from the Syrah grape, and has been famous in France for centuries, producing a very Elegant Style Shiraz/Syrah. Hermitage wines are known for their long life and robust flavor, cellaring over 10 years, up to around 20 years. The literal meaning of Hermit comes from the man who lived in a lonesome chapel in the area where these exceptional wines flourished. These Hermitage wines are Dark, inky black to deep garnet color, and the aroma is very much of black fruits and spice. The flavor has smoke and pepper, sometimes raspberry or blackberry, as well as mellow tannins. They are not as big/blousy as a typical good Aussie Shiraz, but instead produce a more refined structure, still with all the flavour. “Hermitage” was informally used in Australia to describe Shiraz. So, this is similar to the informal use of “Champagne” in Australian sparkling wines which only comes from the Champagne area of France, so technically “Champagne” from Australia is Wrong! I’ve come across many who don’t know this, nothing wrong with that, but it’s funny when they say “Champagne” with arrogance – as if they’re in such fine class to enjoy “Champagne” from Australia. 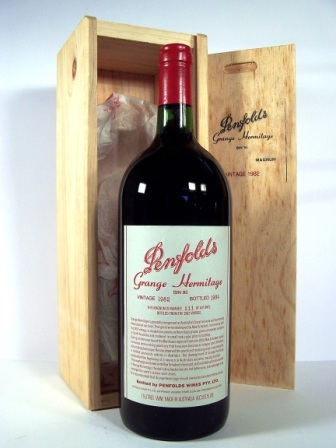 Penfold’s Grange, considered basically Australia’s top wine (Henschke’s Hill of Grace is also an Aus top wine – Penfold’s Grange’s Rival I reckon) first used the Hermitage label in 1989 – this wine was considered Australia’s first exceptional quality, collectible wine. The European Union then quickly objected to this, and the Hermitage label was dropped. So it is now (and before 1989) Penfolds Grange. Anyway, after googling “Hermitage” I found there was not much clear info, so thought I’d just note it down. Hermitage wines of France are indeed lovely and unique, and so are Australia’s Top wines… Mmm mm! Next Post Hangover Cures !